HUNDREDS & HUNDREDS & HUNDREDS…………………..
That’s how many wedding reception events we have hosted. Your celebration party should be Magical,… & experience does count! There’s never a charge (or obligation) to set up a meeting to discuss your big day. So you can decide for yourself whether Evansville Party Master is right for you. Our pre-signing interview leaves no reception tradition or formality to chance, as we discuss customizing all the events that you wish to include and eliminate any you choose to exclude for your party celebration. 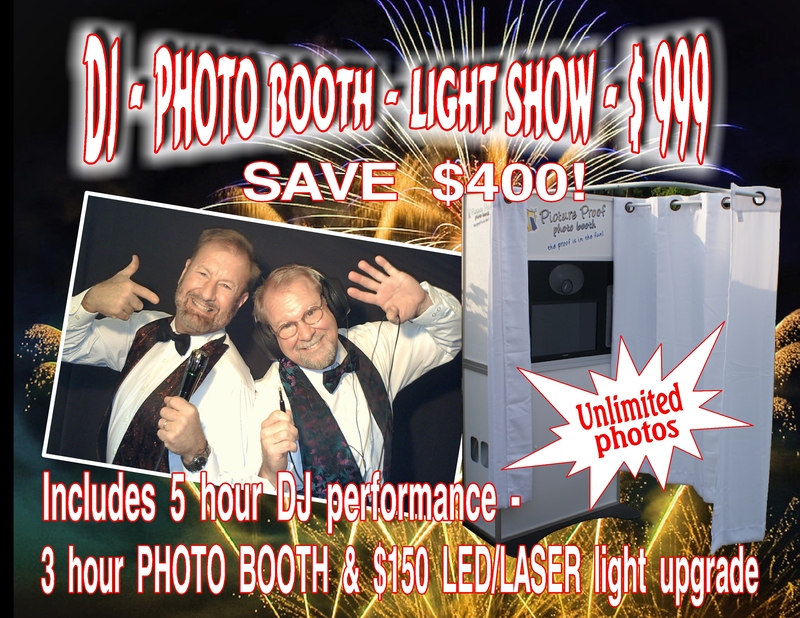 Rates start at $500 for 3 hours including our enhanced LED – Laser Light show (more details on our DJ rates page). No matter your whether your big day will be ultra formal or more casually fun loving, we can provide the music & presentation for the perfect atmosphere to bring your reception party to life! We will do what ever it takes to fill the dance floor and keep your guests groovin’ all night long! We take the time to get to know you and what you want for your reception. Together, we will come up with the perfect plan. Your wedding reception party is your gift back to your guests who have come to celebrate your special day! It’s interesting to note that 20% to 25% of the receptions we perform these days now include musical accompaniment of a custom soundtrack at the wedding ceremony itself! 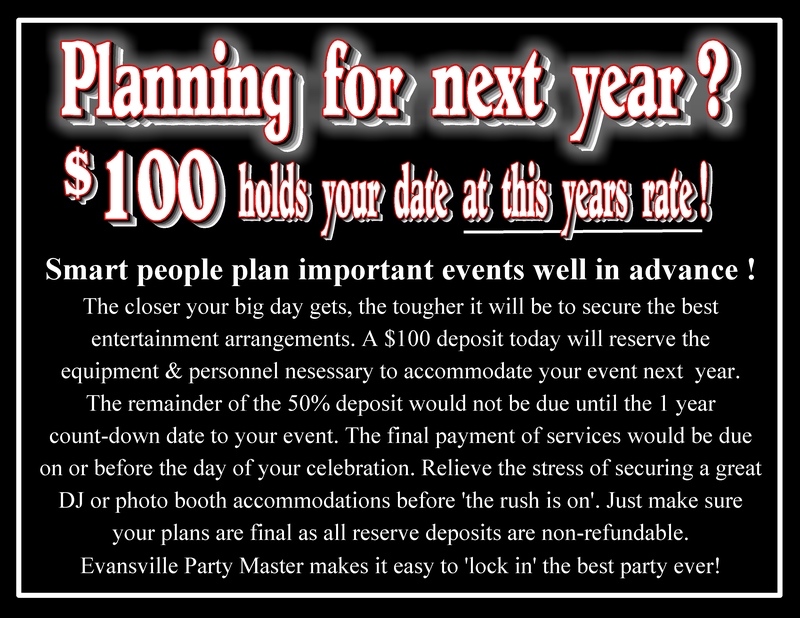 You’ll be able to relax and enjoy the celebration, knowing that Evansville Party Master is on top of all of the details and giving your guests the time of their lives! Don’t forget the photo booth! Get the pics that even the best of photographers just can not deliver! Here’s why: Your photographer is paid to ‘stage’ photos & document the receptions events as they take place. A photo booth invites your guests to create their own photographic statements that range from hysterically funny to profoundly touching & sincere. Many times, these pictures turn out to be among the most treasured wedding keepsakes that simply would not exist without the magic of the photo booth! Best of all, you get a digital scrapbook of each & every photo taken. Unfortunately, we only have one photo booth so when it is booked for a reception, our ‘magic memory maker’ is no longer available on that evening. So plan ahead! We can accommodate DJ performances for up to 4 events on any given Saturday night, so selling out is usually not a problem. However,……..
there are two periods of the year that we have to turn away DJ prospects, the holiday season in December & the summer bridal season. Our advice to you is to make these arrangements well in advance to make your big day everything you dreamed it would be (particularly if you want photo booth services). So don’t miss out! Ask us how $100 will lock in your reception arrangements for next year at this years rates.